In a Thursday appearance on the Today Show, US Ambassador Caroline Kennedy stood by a controversial tweet she posted earlier this year, which criticized the then-active slaughter of dolphins off the coast of Japan. Saying that she had "no regrets" about characterizing the drive hunting tradition as "inhumane," Kennedy explained that the opinion was not hers alone. "That was a US policy," Kennedy said. "I hope I'm an effective ambassador, and sometimes that means working behind the scenes and sometimes that means speaking out." Kennedy was not the only public figure to openly criticize the slaughter, which takes place annually near the southeast town of Taiji. Many international celebrities, including Yoko Ono, Susan Sarandon, and Ricky Gervais, also took to social media to call for a stop to the hunt. 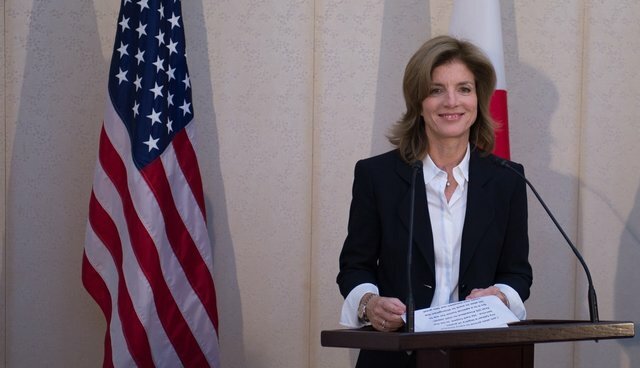 Japanese officials, however, responded directly to Kennedy's comments, calling her sentiment hypocritical in light of American meat consumption. For more information about the dolphin hunt or to learn what you can do to help stop the slaughter, visit our online petition.